Dana Lucas Jr. snatched a fumble out of the air to give Loganville Christian its first touchdown of the game Friday night. However, the Lions couldn’t find more offensive fire power and fell 50-23 to the Brookwood School. 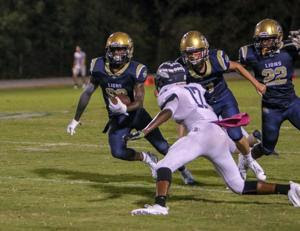 LOGANVILLE — Hurricane Florence produced a bit of rain in the Loganville Christian Academy Friday night but “hurricane Brookwood School” blew into town from Thomasville and put a 50-15 storm surge on the Lions (2-3). The Warriors got on the board early and often, scoring on their first possession at 8:45 in the first quarter. LCA also got off to a fast start on their first possession when Dana Lucas Jr. snatched a fumble out of the air and ran it in at the 5:58 mark. Brookwood hit a field goal from the 24 to take a 10-6 lead at the end of the first quarter. Fireworks broke out in the second quarter with Brookwood scoring twice and LCA once to give the Warriors a 22-15 lead at the half. “We just ran out of gas…and players…at the end,” King lamented. Brookwood scored four more times in the third quarter and LCA managed one more score late in the fourth quarter when, after a Sam Bixler fumble recovery, Jordan Jackson ran it from 25 yards out. “We’ve just got to focus on getting healthy and getting ready for next week,” King said. The Lions will focus another tough Region 3 opponent next week, playing host to Tiftarea Academy.